Notepad++ - текстовый редактор с подсветкой синтаксиса PSIG. Программа выдаёт инструкции PlayStation(MIPS R3000A) в машинном представлении. 1.Generating of single instruction in the message window. 2.Generating of instructions from file to file. 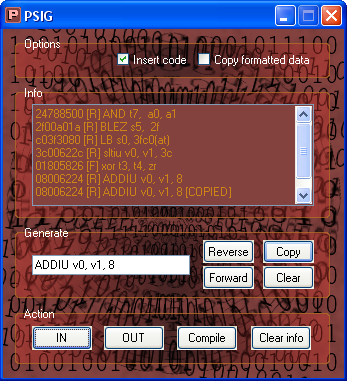 3.Generating and inserting instructions in to the executable file(PSX-EXE/SLUS/SLES ). Constants, variables, strings, labels, pointers. “PSIG Highlighting syntax.xml” - syntax highlighting file, for program notepad++. 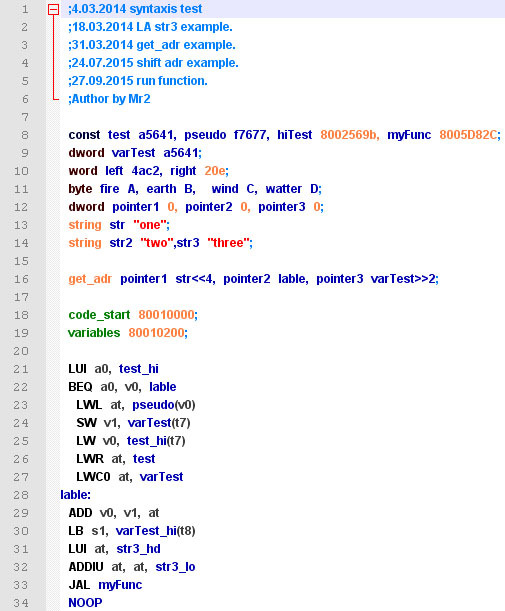 “Syntax.txt” - PSIG syntax description.